This particular email scam has targeted people interested in losing weight (which, let’s be honest, is almost all of us) through a ‘belly flattening exercise’ email which claims to have the secrets to shrinking your waistline. The business name and everything in this email is fake and an attempt to get you to visit the malicious website. Figure A shows the email contents. It is quite bland and consists of all text. It intrigues interest with the subject line, and contains key points about common health problems they claim they can help with. The subject line reads “Doctor Created Belly Flattening Exercise” – they have used the word “Doctor” to back up the claims and even used a fake Doctor’s name within the email’s contents. Unlike legitimate websites which talk about exercise, nutrition and health, don’t be fooled by this email, it is a scam. The sender is shown as “23 Second Abs” (which looks like a fake company), but when looking closer the email address is clearly spam related. Clicking any of the five malicious links in this email will lead you to a website that will infect your computer with malware. 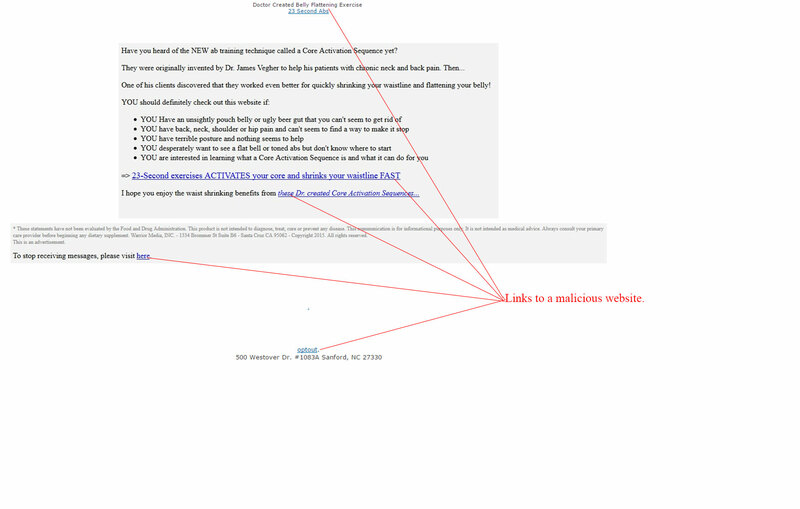 Figure B is a safely captured screenshot of the malicious website in question. It is straight to the point and is standardly branded for a workout sales page however, the video is fake and clicking anywhere on this page will lead to an attack on your computer and personal information through a malware infection. Delete this email to avoid reaching this page. Everything you see in this email and the website are ploys to trick you into clicking through. You will not get any belly flattening exercise tips, only a malicious infection on your computer. As usual, we strongly suggest you delete this email straight away from your inbox, if received.